Are you using Facebook Business Pages? If not, you should. It’s a free marketing vehicle, and with Facebook’s 1 billion users worldwide, you can’t beat that kind of free potential outreach. So let’s start with the basics: what does a business page look like, and what can it do? 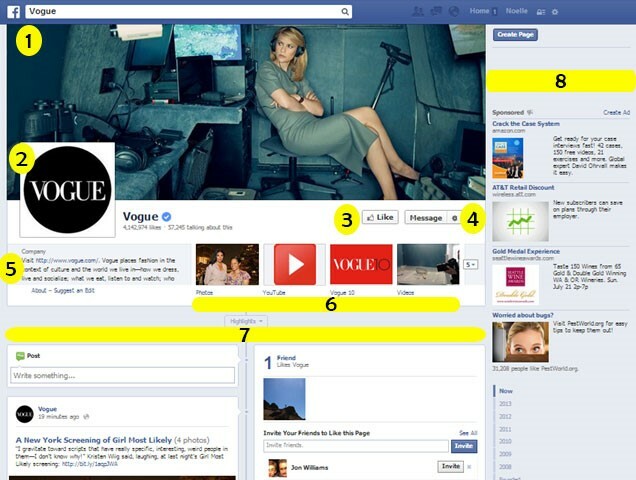 Read on to see our annotated Facebook Business Page layout. All Facebook Business Pages have the same components, laid out in the same way. Refer to the graphic below (also here, in larger form) to see each of these described parts in action. Cover Photo. This image conveys something about the brand or mood that the business is cultivating with this Facebook page. It lives only on the Facebook Business Page. The best size for a cover photo is 841 pixels wide by 315 pixels tall. Cover photos can be switched out as often or as rarely as the business wants. Profile Photo. This is usually a logo. It appears in the News Feed, next to each post that a business makes. To make sure your customers know what to look for in their News Feed, it’s advisable not to change it often – or at all. The dimensions are exactly square, and must be larger than 180 x 180 pixels when uploaded. Like Button. This is where a Facebook user can become (or un-become) a follower. This is where your gain your followers: at the behest of the “Like” button. Message Button. This is a button that customers can use to send a message to a business page’s owners. It’s completely up to you whether you want to respond, though Facebook advises new businesses to do just that. Company Information. This text is available to tell customers something brief about the business. Once entered, this need not change, unless you want it to. Content posts arranged by type. There are sections here, such as photos, YouTube videos, etc. which arrange posts you’ve made into groups by type. That way, if a follower is only interested in posts you’ve made which contain pictures, they can click on the Photos button here to see them all. Timeline. This is a chronological arrangement of all posts you have made in the past, sorted by most recent at top. Ads. This is the “cost” of doing business on Facebook: ads are presented to followers based on their browsing behavior (and have nothing to do with what is on your page). That means that you run the risk of having a competitor’s ad shown on your business page. This is how Facebook generates the revenue it needs to survive. Ads are targeted to the viewer, and every single Facebook user’s experience will be different. All things considered, the benefits to having a Facebook Business Page greatly outweigh the risks. Customers are out there, and you can find them. In future posts, we’ll discuss best practices around posting to your followers.